This is a wonderful transition into Spring. The wind is still cool so we need something to wrap around our necks. All silk pieces are perfect for travel because of they are so lightweight and take up no room in a suitcase for packing. The silks can be worn for a casual look with leggings, jeans or dress it up with jewelry for the evening. You'll be stunning and sure to turn heads. Easy to take care of: Hand Wash in Lukewarm to Cool Water, Press on the backside when wet and you are ready to go all over again. Please see further wash instructions in shop policies. Instructions are sent with each package. 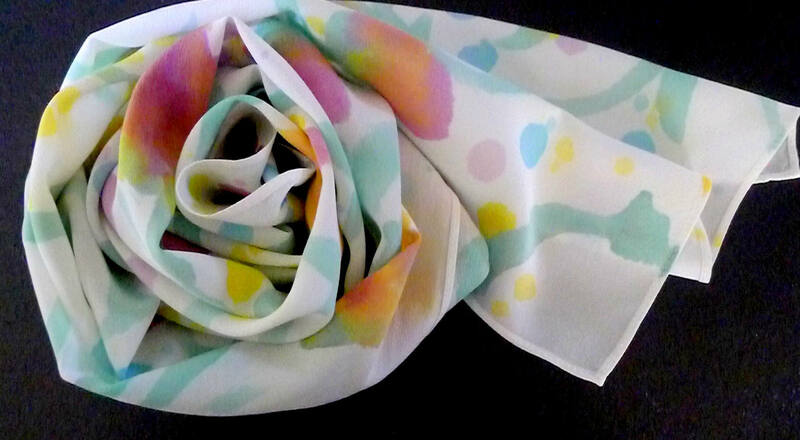 I specialize in creating original silk design for your personality. I would love to help you plan the most beautiful a wedding special event,or hand painted fabric specific to your desires.I can also create personal art, yardage or colors for you.